Automata is one of the latest restaurants to open up as part of the Old Clare Hotel in Chippendale, alongside Central Park. The restaurant features 5 course menus plus snacks by ex Momofuku Seiobo chef Clayton Wells in a sleek, industrial looking space. 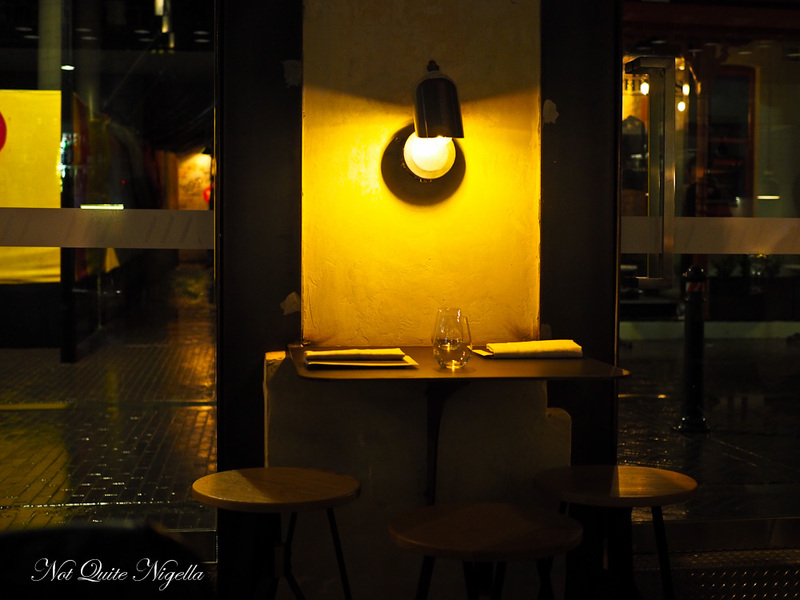 Most of the seating is share table style and there is also a matching wine list available. Dear Reader, do you have one of those friends that can eat an untold amount of food yet stay an envious size extra extra small? Well let me introduce you to the Black Widow. We've been friends for over 10 years and she has the ability to eat large amount of food and still look no larger than a wisp. And she currently holds the record at a restaurant for the most amount of bread rolls eaten by a customer. 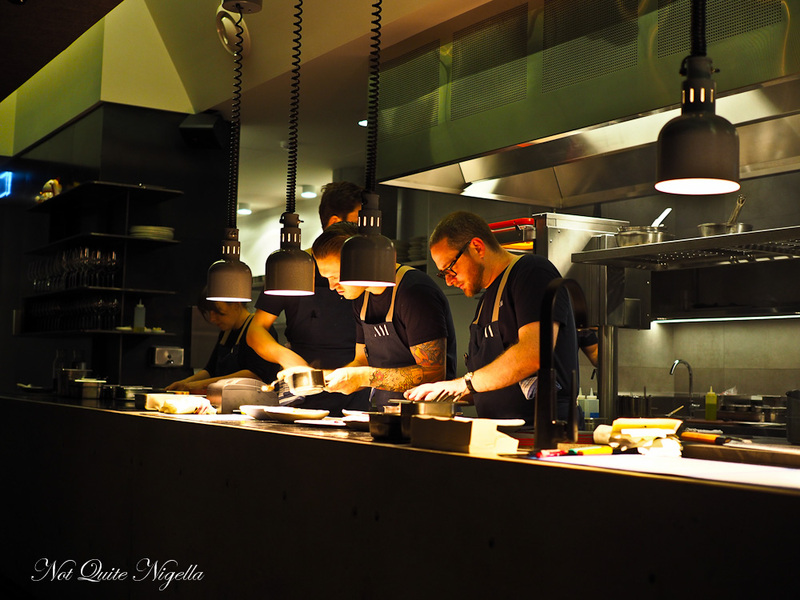 We were dining at Automata, a new restaurant in Chippendale. Situated on Kensington Street at the Old Clare Hotel it is a restaurant by former Momofuku Seiōbo sous chef Clayton Wells and commercial partner Loh Lik Peng. They're both here tonight along with some food critics and well the Black Widow. She may look small but don't steal her butter. Like really, don't steal her butter. Automata is an industrial looking space with one long share table plus a few small tables along the window as well as an upstairs section. The surfaces are hard but warmth is from the abundant lighting and the acoustics - it's actually possible to hear conversation here which is nice in a space where sharing is the norm. 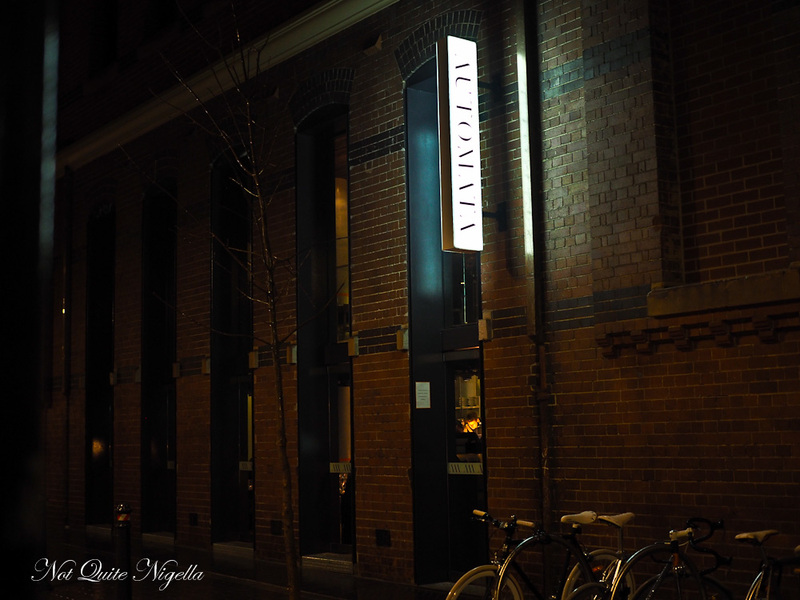 The menu features 5 courses for $88 per person with a $55 matching wine list. The Black Widow had told them about her nut allergy when booking and the staff do well to double check this along with some other ingredients. There are two seatings a night: an early seating and we arrive at 6:30pm to be out at 8:30pm. The open kitchen keeps pace well, not rushing but with no lags so that everything arrives in a timely manner. The appetisers arrive and to the left is a piece of crispy salmon skin, kind of like two gigantic chips topped with two squirts of creamy yuzu kosho, a citrus chilli condiment ubiquitous in Japan's Fukuoka made with yuzu, chilli and salt. Their version of kosho also adds mentaiko or cured Pollock roe. 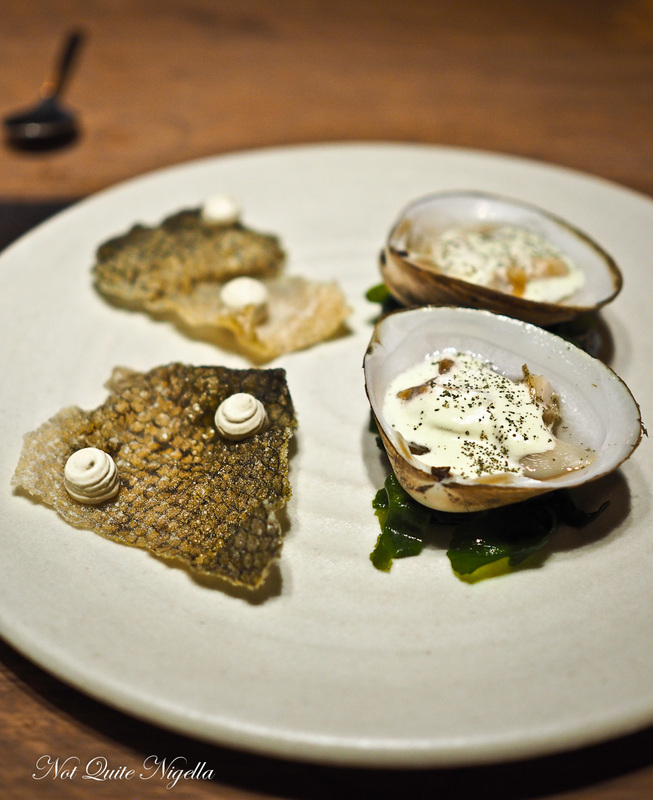 To the right is a storm clam that is fresh, smoky and lighty sweet with a fragrant rosemary dashi, cream and rosemary powder. It is an excellent start to the meal. 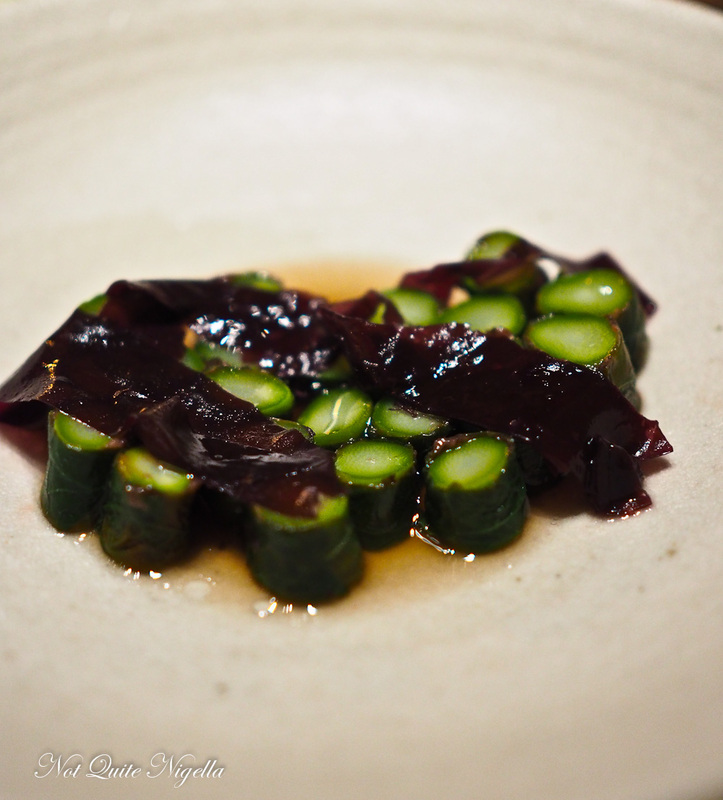 This dish of sesame leaf wrapped asparagus is finished at the table with a plum, aged anchovy and white soy broth. 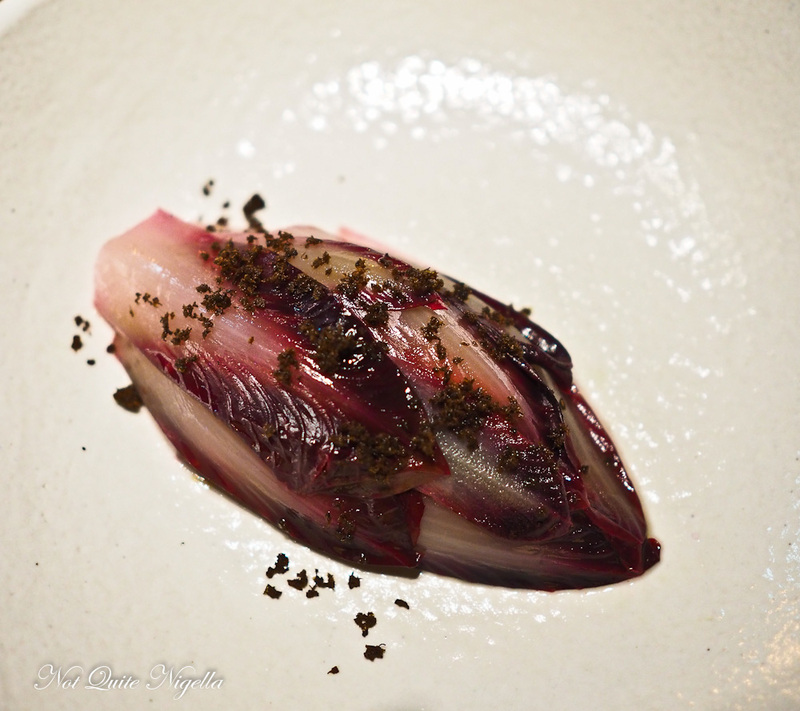 It is topped with thin leaves of dark purple dulse seaweed. The bread is set down and our eyes light up. I'm convinced that the Black Widow and my friendship is based on a mutual love of butter and hatred of exercise (except she doesn't need it). 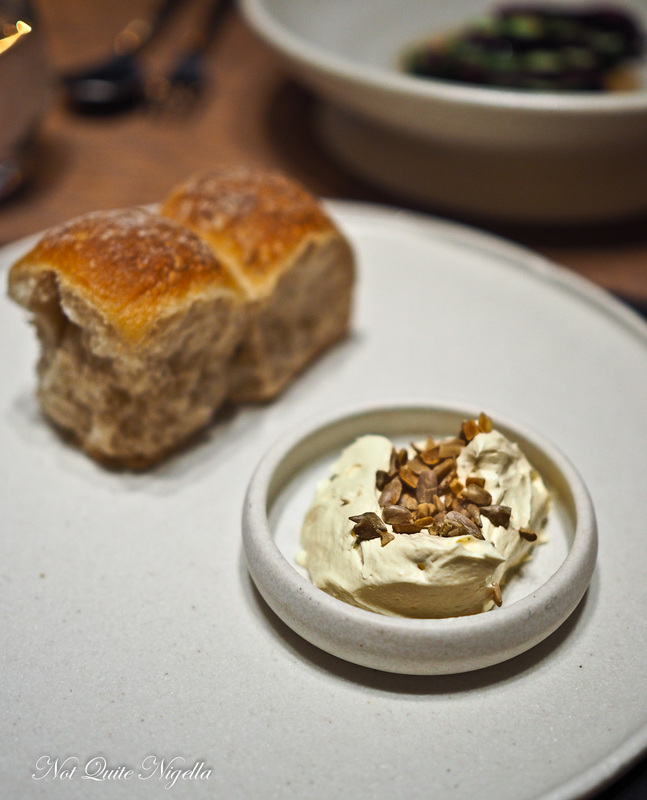 The house baked buns are both innies (you know the soft sided pieces) with a whipped Pepe Saya butter flavoured with anchovy and chicken jus. It's so light and delicious that we finish it quickly and they offer to bring us more...and more. 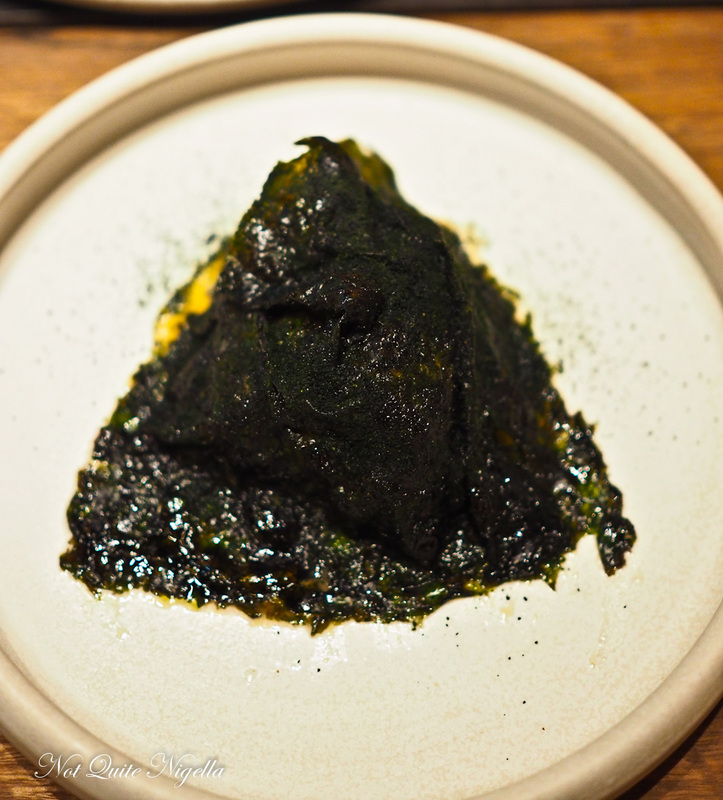 Cloaked under a sheet of laver is the New Zealand hapuka, a buttery soft pyramid shaped fillet served with a creamy, rich John Dory emulsion, seaweed butter, wakame powder and a salty, delicate succulent that our waitress describes as sea blade. 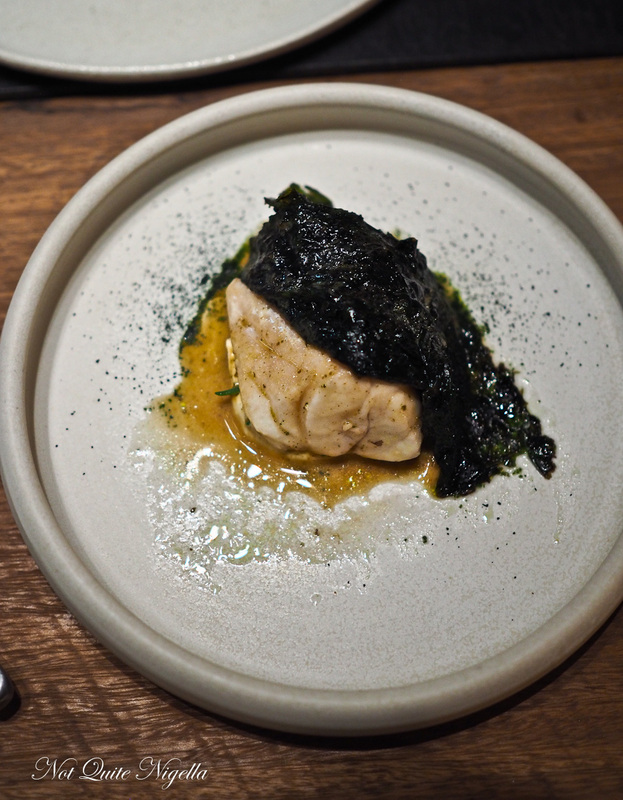 This is one of my favourite dishes as it has such an appealing umami quality to it while the fish is richly succulent in texture. And you'll need some bread for this sauce too (by now we're on our third piece. "We are officially the bread table," says The Black Widow completely accepting her fate). The next course is the braised quail leg with a Granny Smith apple and caper dressing under leaves of soft, slightly bitter red witlof and caper crumbs. The texture of the quail is cooked but pink and it gives it a luscious quality while the sweetness of the dressing is balanced against the witlof. 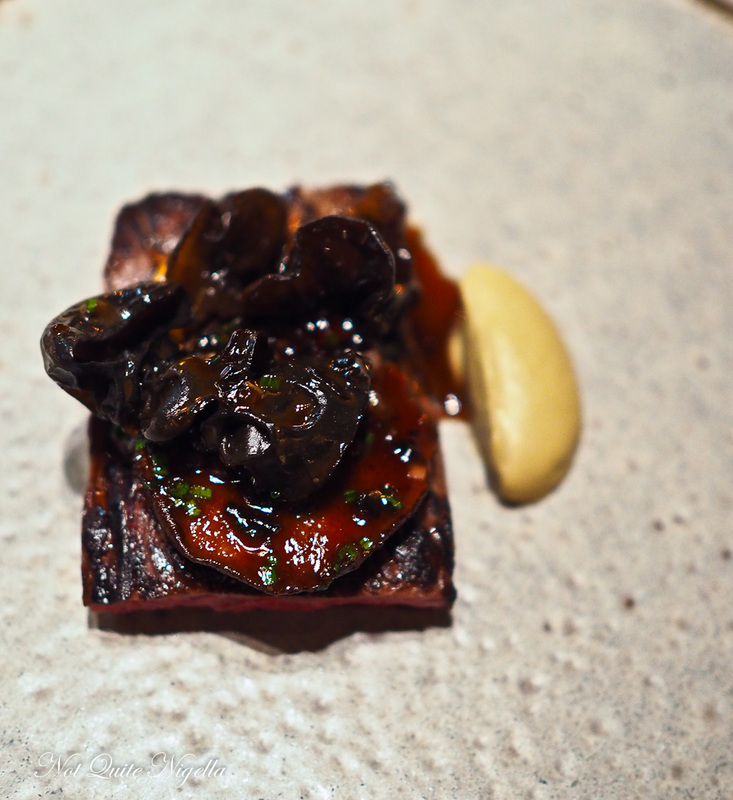 Our last savoury course is the inside skirt steak with a flavour infused ‘log grown’ shiitake mushroom from Birregurra, Victoria, wood ear mushrooms and baby king brown mushrooms. The sauce is a tamari and browned butter one with a quenelle of eggplant puree on the side. The beef is a 300 day grain fed beef from Rangers Valley in NSW that has been dry aged for 2 weeks. The result is a pronounced savouriness to the dish with an other worldly texture to the steak. Even though my stomach is punishing me for eating four buns (the tight dress was not a good idea, never buy small! Big mistake!) I finish it all and then wish I had more bread to soak up the sauce. "What's the most bread you've given out to customers?" we ask and our waitress answers four rolls. "They were big guys too," she says not realising that we have had four too (another waiter had given us a serve). The Black Widow's eyes flash, "I want to be the record holder," she says with a determined giggle. And a fifth serve was sweetly requested because in her infinite wisdom she has learned that if you like the bread and butter it can't hurt to ask for more. All they can do is cut you off. It's dessert time and even though it is just past 8pm and we need to vacate our seats by 8:30pm we haven't felt rushed at all. 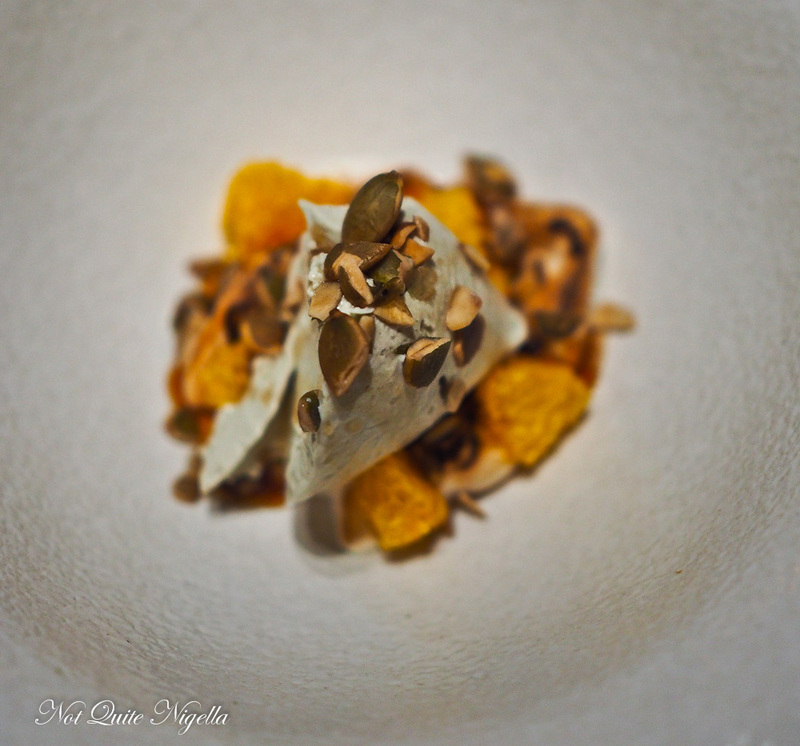 The pumpkin sorbet is very creamy and smooth and served with dehydrated mandarin segments, seabuckthorne, pumpkin seed oil, pumpkin seeds and bitter meringue. It's the sort of dessert that has lots of different elements to balance and keep it interesting. The petit fours are the kind of jellies that you might take to or not depending if you like strong, menthol or herbal liqueurs. 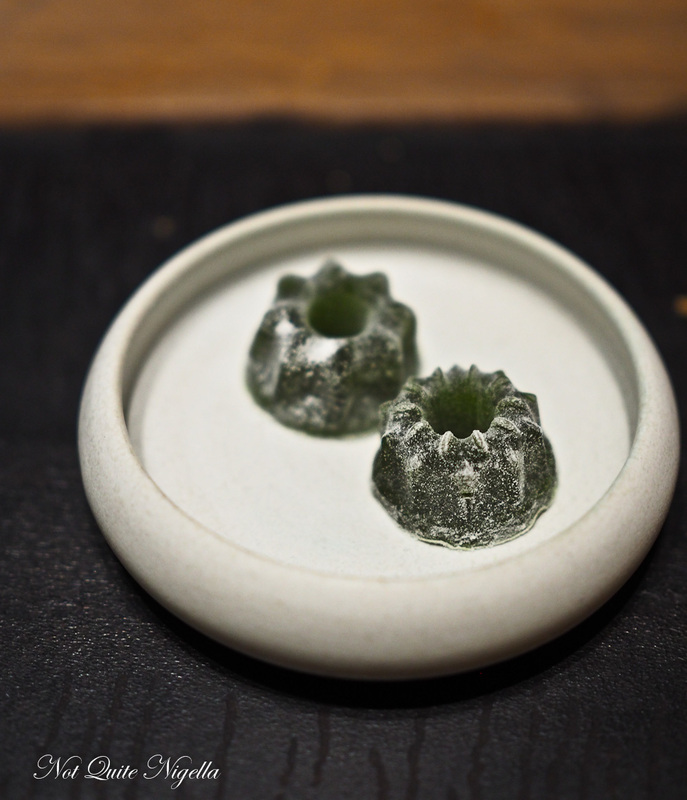 They are tiny creme de menthe and Fernet Branca jellies. These are of course chased by the Black Widow's final fifth roll, which she smothers with a double serve of butter and eats heartily! "I wore a loose dress on purpose," she confides. P.S. We nicknamed her the Black Widow after the competitive eating champion Sonya Thomas (as opposed to someone who marries and kills their spouse). So tell me Dear Reader, have you ever asked for more bread? Do you have one of those friends that can eat anything and everything (or are you that friend?)? And if you were to have a pseudonym, what would it be?